These Are The Facts Behind Boat Capsize! Nearly 34 people feared dead in the boat capsize incident in the Godavari near Manturu, Devipatnam Mandal, East Godavari & Vadapalli, near Kondrukota West Godavari district. Heavy winds caused the mishap as per the information. Nearly 50 people were traveling in the boat at the time of mishap and there is no trace of 40 people. There is no clear picture on the number of deaths as well. *What is the reason for the tragedy? The boat started with nearly 50 people of a marriage group. They have loaded cement bags in the same boat. Heavy winds started as the boat traveled for some distance. As the cement bags are getting wet, they have closed the doors of three rooms in the boat. The weight was already more. The boat staff have put a tent on the roof and made the passengers sit under the tent. The tent couldn't withstand the heavy winds and the boat lost its control as well. Though many people swimming, they could not come out of the rooms as they were locked from outside. Ladies, children and several elders have died in the capsize incident. The eye-witnesses are saying that they have warned the boat driver not to carry many people along with the cement bags but he didn't listen to them because he was getting more money and that's the main cause of the accident. *The incident came out because of them.. The majority of the people who were on the boat were tribals of East Godavari agency area. The survivors who swam the river to save themselves have given the information to media and police. The location of the accident was between two hills and it was very deep. AP Government has responded to the boat capsize. 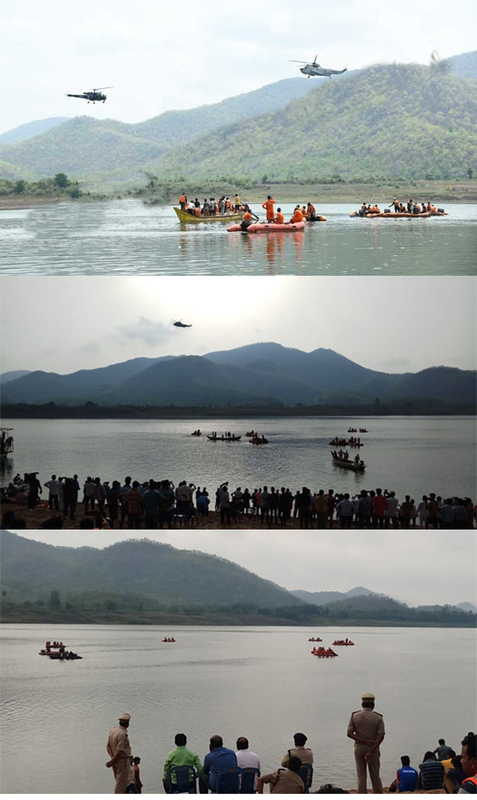 They have immediately sent NDRF team for the rescue operations and 60 trained staff is searching for the boat. They have identified that the boat has submerged under water and got struck in the sand. It is not coming out because of the cement bags. AP CM Chandrababu Naidu, Opposition leader YS Jaganmohan Reddy expressed their deep shock over the boat capsize incident. Chandrababu asked the officials to arrange an emergency team for rescue operations. On the other hand, YS Jagan gave a call to his party workers to the give their helping hand to the victims.